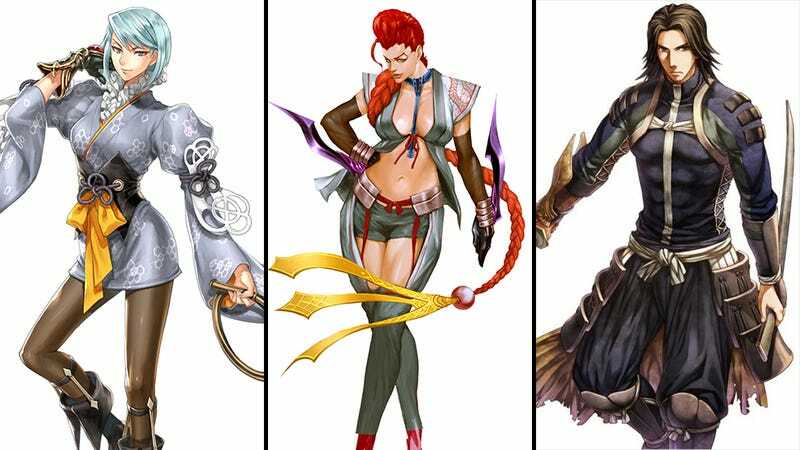 Ever wonder how Capcom’s greatest heroes and heroines would look as samurai? Or ninja? Or geisha? Well now is your chance! Onimusha Soul is a Japan-only browser (and smartphone)-based customizable card game. Much like in the Valkyria Chronicles browser game, you build your own squad and battle against the squads of other players. But the real gem of this browser game is all the cameo characters from other Capcom properties. This includes characters from fighting games like Street Fighter, Darkstalkers, and Rival Schools to characters from other classics like Mega Man Legends, Resident Evil, and Ace Attorney—just to name a few. Instead of simply dropping in these cameo characters wholesale, straight from their own titles, each has been redesigned with a Sengoku Era (mid-1500s) look. Moreover, the characters’ designs become ever more outlandish and magical as their power increases. And while the majority of the cameo characters are female, occasional male characters like Dante (Devil May Cry) or Crow (Okamiden) are also collectible. Various popular monsters from Monster Hunter and Resident Evil have appeared in special events as well. Even now, ten months after the game’s release, new cameo character redesigns continue to be released. So check out a sampling of the cameo characters below. And if you still want more, head over to the Onimusha Soul homepage to see how these characters look as they get more and more powerful. Onimusha Soul was released on October 19, 2012. There is no word on an international release.